This summer Moscow has become not only a football capital of the world with more than half a million guests from 30 countries. Art fans are also here, but for a different reason: the 6th edition of the Moscow Biennial of Young Art is taking place from June 8 until July 31 at 5 different venues across Moscow, including an abandoned industrial space “Rassvet” (Dawn) that used to belong to the furniture factory, an imperial court supplier, and was carefully restored to become an exhibition and event space. Moscow International Biennale of Young Art, the only of the kind, has been held since 2008 and over time became one of the largest and most ambitious projects in the field of contemporary art in Russia. It provides a space to present the most up-to-date strategies of young artists and curators. From last year not only artists, but also curators have to be under 35 years old in order to participate in it. For the Biennial of 2018 Lucrezia Calabrò Visconti, 27-year-old independent curator from Italy, was appointed to curate the main exhibition project. The Biennale's main project, entitled Abracadabra, explores artistic practices that dwell in the high-performance landscapes produced by the economies of presence and features artworks in all mediums - installation, video, sound and performance. It features 58 works by artists under 35 years old selected from over 1,500 applications from all over the world. The main show is supported by 2 “strategic” projects - “The Site is under Revolution” by Barbara Cueto taking place in Moscow Museum of Modern Art and “Please, thank you, I’m sorry” in the National Centre for Contemporary Arts (NNCA) curated by Zhenya Chaika, as well as by the plethora of the collateral events including “Ideal Age”, Biennale's special project, shown simultaneously in the courtyard of at the AZ Museum and at the Educational Center of MMOMA and focusing on the problematic experience of aging in contemporary world. Our observer Elena Rubinova spoke to Lucrezia Calabrò Visconti, the curator of the Biennial’s main project, and the young artists Sabrina Chou (USA) and Vasilis Papageorgiou(Greece) about the exhibition concept, their understanding of national and international in contemporary art and how they see the role of a “soft power” in the epoch of globalism. How has the theme of “abracadabra” come about in the concept of the exhibition? What does the word stand for? The title of the exhibition acts as a roof term, a temporary placeholder for multiple forms of research. “Abracadabra”, as an exhibition title, draws a line through contemporary forms of exposure and invisibility, enchantment and disenchantment, suggestion and secrecy in contemporary society, and it was my goal as a curator to visualize that. The word is used in so many languages, including Russian, but we do not exactly know where it came from: it can convey diverse meanings, depending on different geographies and epochs. Linguistically it's an archaic magical incantation, a performative word, something that can have an effect on reality. And, of course, before coming here I did not have a slightest idea of the Russian connotation– apparently it was known here in the 80s as a disco hit by the Steve Miller Band that was hugely popular in the Soviet discos. Also as I learned in Russian the word “abracadabra” also means gibberish or nonsense. In the course of this year-long project you were dealing with more than 50 artists of our generation from all over the world. In your understanding what does it mean for them to interact and find a common language in this world of “abracadabra”? How important is cultural dialogue for them? Lucrezia Visconti: I’m convinced that contemporary art and especially the exhibition making is a perfect tool to be building a stage, a platform for a dialogue. In my context it was great to grant the artists the possibility to come to Moscow in person – and I would favour even more of them to be here - in order to talk together during the installation stage. In the concept of “abracadabra” it was especially important to develop relationships between Russian artists and their foreign colleagues – so some flew in, but others who are from Moscow or other Russian cities, also came in person. You cannot overestimate this opportunity. Is building the relationships different for your generation, and if yes in what sense? Lucrezia Visconti: Definitely. Everything is way faster in the Derrida’s economy of ‘presence’, and sometimes you can go wider in the sense that if, for instance, I need to meet someone from Japan and it’s a lot easier than it would have been 25 years ago in the past. But at the same time the depth that you can get it shallow – everything has to be done so quickly that you lose a chance to engage in a deep conversation and find ways to know each other. From your experience of doing this project for almost a year, was it a dilemma for some artists to participate in the Moscow Biennial because tight political situation between Russia and the West? Lucrezia Visconti: When I announced an open call and shared the information with all my contacts all around the globe it has been a point of dialogue for some artists – whether to participate or not. I managed to persuade most of them and I must say, that almost always it’s the matter of trust. It puts a lot of responsibility of the curator, but once this trust is reached, the artist will be happy to participate. Also I must say that I did not feel any pressure on behalf of the organizers - the Ministry of Culture and ROSIZO. And my feel is that young artists need and want to build bridges, despite political situation that changes fast, and they have a long way to go in art. Sabrina Chou: I definitely thought about it, but for me the decision whether to come to Moscow and to participate was the matter of working with Lucretzia, the curator and her exhibition concept was interesting to me. Art can function in different ways – on the one hand it’s part of a global world and political landscape, but art is also a space that is outside of global politics – it is definitely connected but at times it can offer an escape or a moment of relief to pause from it. Vasilis Papageorgiou:As a contemporary artist, I can function in different ways – I often travel to show works, mainly in Europe, I do residences. So, to me participation in any Biennial is always a chance to show you work and if your work has good content, it can function in any political environment. What significance do you, as representatives of the young generation, attribute to cultural diplomacy? We now see in this post-postmodern environment that things are “deflating” a little bit. What’s your take on that? Sabrina Chou: I think that now it’s very different compared to the time when “soft power” was so much in demand in the 80-s and 90-s. People identify themselves differently nowadays. Along with the rise of nationalism elsewhere, there is a different tendency in the art world -- more artists like individuals and less like representatives of a country or nation. As an American – I’m from LA - I know that there were other decades when government used to sponsor artists – now it’s different because of globalization and because people are much more fragmented. I now live in the UK, I spent several years in Netherlands and see similarities no matter what county you live in, but cultural dialogue helps to overcome many problems. Vasilis Papageorgiou: I more than agree with this opinion. In terms of nationalism it’s best to interact with this subject by not identifying yourself in these terms of a nation. In Greece we are used to live with this new understanding of national and European – it has been more that 10 years now that Greece exists in this dimension and now we are used to function in this “new normal”. I believe that the young generation has to adjust to this new reality and build their own world accordingly. What were your personal expectations from Russia and your work with the local artists? Lucrezia Visconti: It was a very enriching process and an ambitious project that allowed me to have some sort of a test – the test for your way of thinking, to your ability to relate to different realities, so I’m really grateful for this. Vasilis Papageorgiou: I wish we could stay longer in Moscow. From what we have seen during the exhibition montage, it’s a fascinating, vibrant city. I very much hope to come again. 694: 30 seconds to mars. 6th Moscow Biennial of Young Art decodes ''Abracadabra''16 July 2018: 6th Moscow Biennial of Young Art decodes ''Abracadabra''! лучшие комедии. 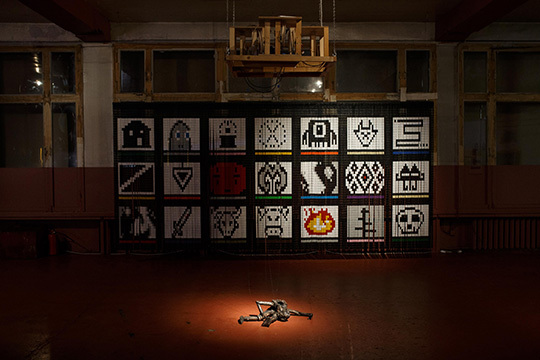 6th Moscow Biennial of Young Art decodes ''Abracadabra''.